In the end it was the rates that killed us in the Grassmarket. The landlord was very good about the rent and didn’t put it up when he should have but I feel very badly let down by Edinburgh Council. I’d been told they had spent 4 million pounds on the “improvements” and hoped to soon have a BID (Business Improvement District) in place. As it turned out the BID happened a year late and just oversaw the further decline of retail. More of that another time. Obsessed with the tram works the Grassmarket was abandoned from the first Christmas I was there and the Christmas market cancelled. This culminated in last Christmas when everything was done to attract visitors to Princes Street and St Andrew Square and nothing to bring them to the Grassmarket. That the BID did nothing to remedy this beggars belief but I was told the committee felt money would be better spent on other things ! It was no surprise to see footfall figures were down 10% in December showing a month on month decline every month from August something unheard of in retail. What is worse the Grassmarket footfall figures are taken at the Grassmarket Hotel so many of those counted do no more than get to the bottom of Victoria Street and turn around never getting anywhere near the majority of the shops. The council funding for a council employee to help with events in the Grassmarket ran out a year after the works were completed so given the BID was delayed by a year there was nobody from the council to help almost as soon as I moved in. The council had asked to meet me as they were very keen on the idea of an “arts quarter” and to be fair they had said they had no money but could help with red tape. Another problem not council related was that The Lot then closed and the lady who owns it can clearly manage without the income and has declined anybody interested in using the building. There was the constant promise that things would improve once the BID was in place to liaise with the council but very little indeed seemed to happen. Even more galling was that when big events were put on they regularly involved blocking people’s view of Avalanche, Helios Fountain and the West Port. Large inflatables, film screens and stages all ended up blocking us off and that was by no means all. Most events involved fencing being put in front of the road and therefore blocking easy access to the shop. However as soon as there was a market that might attract folk down our way that was placed in the middle and led to people just looking around and then turning back up Victoria Street. All these events led to LESS takings and the market sadly did not improve things either. Some might put this down to the decline of the record shop but Helios Fountain who have been in the Grassmarket for 30 years and keep scrupulous records said sometimes things were so bad they matched the bad old days when all the work had been done, dark days that thankfully I had missed. Shops in the West Port also reported a drop in takings. The council has recognised the rates problem and for smaller properties with a rateable value under £10K they now pay no rates at all but this does not help many in the Grassmarket. Similarly because I took on a shop that had been empty for a while I would now receive some rates relief but sadly not 4 years ago. What it has left me with is a huge rates bill I’m still paying off and I have absolutely no idea what I got in return. 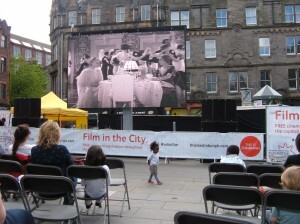 In fact it seems to me the council spent that money encouraging folk not to visit the Grassmarket. Maybe even at this late stage I’ll get a refund !